It has been an awfully long time since I've posted new resources. This is due to a combination of factors leaving me with a little less time for blogging. Anyway, here's another freebie to keep you ticking over until the next post! 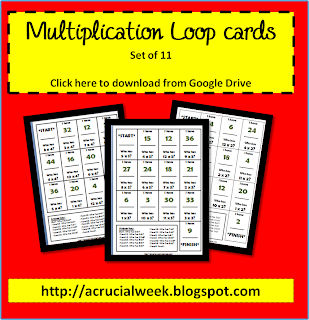 Click on the image below to access simple multiplication loop game cards. I've also previously posted addition and subtraction versions. If anybody downloaded the subtraction one when I first posted it, there were some mistakes. I have since changed them and uploaded the edited version.